The page also supports Date filter and Number of items per page. The order of the filters how they appear is configurable as well the number of results per page. We’ve prepared new improvements for Feature story performance: sharing buttons for social media and “You May Also Like” widget displaying on the bottom. To provide users an easy way to share Feature story, we’ve added sharing buttons at the top of the article (between the main image and the text). In order to allow services the option to engage user with other content from the site after reading a Featured story, a “You May Also Like” widget has been placed at the bottom of the page. Particular widget pattern will be set up on the Zone level. If you enable this option and choose the Program (Zone), the Live stream widget will display only that particular program when it’s Live. Only Programs (Zones) from current site will be displayed. The other new feature is a Fallback widget (4), which can be chosen from Widget library. Purpose of this feature is that when the selected Program is not Live at the moment, it is possible to display any widget from the Widget Library in the same place (e.g. with a banner promoting the show, or content which is relevant). 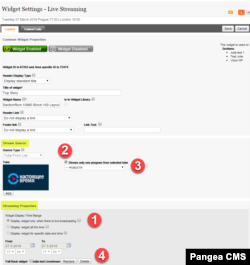 This widget is a great option for program pages, where services could use the widget to display on-air content (live stream) for a specific show at a specific time, and when the show is not on-air, switch to a content widget, all this done automatically by CMS. The feature will be rollout on a request basis. so please send us a request if your service is interested. To improve the user experience of Media Zone Archive, we’ve made some redesign of secondary navigation. Now, this navigation is lighter, looks better and helps to emphasize the name of the show. Remember in the previous release we implemented the option to add banner and branding for the shows, if your service would be interested please let us know so we can help you with the branding. You will thus be able to display a version of Section Page with placeholders or version with images. It is now possible to combine your news feed in multiple languages. Now you can subscribe to your favorite audio and video shows to be notified when new episodes are available. Scheduler alerts also give you the possibility to be notified when a program is on-air. PsiPhon proxy solution is integrated to allow users to submit the content from any environment regardless the political borders.